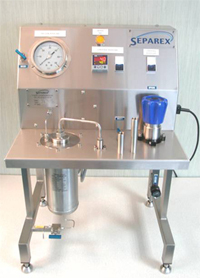 Supercritical extraction mostly uses carbon dioxide at high pressure to extract the high value products from natural materials. Unlike other processes, the extraction process leaves no solvent residue behind. Moreover the CO2 is non-toxic, non-flammable, odorless, tasteless, inert, and inexpensive. Due to its low critical temperature 31°C, carbon dioxide is known to be perfectly adapted in food, aromas, essential oils and nutraceutical industry. 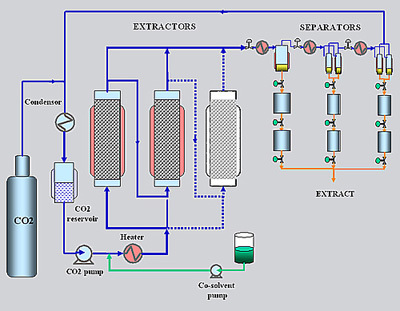 The schematic process diagram shown above describes the "classical" batch extraction process. 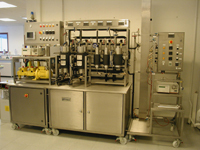 The equipment is composed of one or several extractors consisting in high pressure autoclave(s) with fast-opening systems in which the material to be treated is set inside a “ basket ” easy to put in and to remove, and a separation section where extract and fluid are separated prior to fluid recycle through condensation and liquid pumping. The major issue of such operation is the fact that it is a batch process. 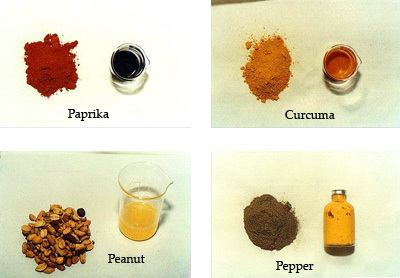 Among the dozens of natural products extracted in Separex since 20 years, we can mention coriander, black pepper, basil, paprika, marjoram, celery, curcuma, pimento, vanilla, cinnamon, ginseng, peanut, sunflower... The picture here below shows the aspect of four extracts.